Camping hammocks are a lightweight alternative to tents and camping mattresses. 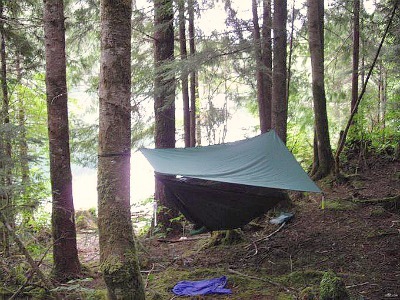 Firsthand experience about sleeping in a Hennessey hammock - the portable hammock built for the woods! Who says its fun to lug around a huge pack with pounds and pounds of stuff through the woods? Hammocks are the cure for back aches! If you love backcountry camping and packing light, then a backpacking hammock is the perfect choice for you. Well… only if you’re camping where there are trees of course! The most intense campers I know use a hennessey hammock and swear by it. (these people are so intense that they only bring a portable hammock, sleeping bag, knife and a few other odds and ends)! This picture was taken deep in the mountains on Flora Lake, North of the Nitinat River Valley on Vancouver Island. There were zero spots to put up a conventional tent, so my friends improvised and slept in their ground tent anyways, on a slope on roots and rocks... they were verbally jealous as I gracefully swung above them in my hammock. It sleeps two! and is very comfy with company. The main Camping hammock is the Hennessy Hammock . This portable hammock was MADE for camping. Click on the picture on the right to read reviews or purchase it online. Concerns you might have about sleeping in the Hennessy Hammock ? · Bugs: These specially made tents have a built in screen that keeps bugs out. · Rain: This has also been considered! These tents have a built in cover so that if it rains you stay dry. · Comfortableness: Who hasn’t fallen asleep on a lightly breezy day in a hammock to the sounds of birds singing? If you haven’t… well, then give it a try. If you have, you’ll know that hammocks are comfy. Plus Brazilians are known to often sleep in hammocks. After a long day of hiking or canoeing, a hammock will be a great place to sleep! · Temperature: Because the breeze can flow under a hammock, they can get a bit cooler than sleeping in a tent, so bring a camping pad for extra warmth if you loose cold, or bring a thicker sleeping bag. Why camping hammocks are great? Well, instead of having to bring a sleeping mattress, PLUS a tent, you only have to bring a camping hammock, which is lighter and more fun! Poisonous creatures. You are safer in a hammock than on the ground if there are poisonous creatures, because you can’t accidentally put your tent on a poisonous animal. Cool Factor. If you want, you can hang your hammock a great deal off the ground and be ‘extra cool’, when your camping buddies don’t know where you’re sleeping! You can sleep well on the Hennessey hammock because it’s big enough to sleep diagonally, so you’re not curved in the middle, allowing a good nights rest. There are many other good hammocks for camping that are made from nylon rope, or even parachute material which is lightweight. These are fair-weather hammocks and are only good if the weather is nice and there are no bugs or, for lounging and relaxing in the afternoon.